The overwhelming abundance of data available on the web is empowering but also intimidating. By using a platform to handle your marketing campaigns’ reporting and analytics, you can improve your marketing department’s overall performance. When you are a data-driven marketer, you can prove to executives and the rest of your company that your efforts are delivering value in line with your company’s financial goals. By using a platform with in-depth reporting capabilities, such as email reporting and cumulative reporting, you can drastically increase your efficiency. 1) You can use dashboards to easily visualize & share reporting and analytics. Understanding the performance of a marketing campaign visually improves your ability to communicate marketing metrics to other members of the company. For example, if you want to visually conceptualize the average email opens per day of the week for a certain email campaign, you can view it in a color coded pie chart on the dashboard. Or, if you want an overview of all messaging programs deployed and emails sent per day, week, month and year, you could view each of these in a bar graph. When you are writing reports and overviews of your email marketing progress and success, it is invaluable to have this visual aid. As pointed out by the Marketing Analytics company Kissmetrics, 65% of people are visual learners, and presentations with visual aids are 43% more persuasive. Therefore, it’s worth it to not only have data at your fingertips, but also to package it and present it in a way that’s easily digestible to your audience. 2) You can forecast results and plan for future success. A major way that a platform can be a gamechanger is because it’s a centralized place where you and your marketing team can set goals and track progress. Using a digital platform, you can figure out how to improve your future ROI instead of just proving your current ROI to other members of the company. A platform visually helps you think about your marketing goals and strategize from using the real-time data in front of you. According to the tech research firm Forrester, one of the greatest errors that marketers make is that they don’t use the data analytics in front of them to monitor the increases in customer value to their companies over time. A digital platform empowers you to track buyer behavior to predict which segments of customers will help your company become the most profitable in the future. Once you know this information, then you can target the right prospects and increase conversions. 3) You can funnel your marketing dollars into areas where they’ll be most effective. As a marketer who is responsible for justifying your department’s budget, it’s critical to prove that you’re putting your resources where they will have the maximum financial impact. You are at a serious advantage when you can use a digital platform to identify which channels and campaigns deliver the most revenue and highest marketing ROI. For example, let’s say you’re working in the marketing department for a snack food brand. Right now, you spend the majority of your marketing/advertising budget on traditional channels such as print ads and TV commercials, rather than on digital channels like social media. Your boss and other executives are reluctant to divert spending from the traditional channels to the digital channels, although you know it would be a more effective use of marketing dollars. You can use a digital platform to visually conceptualize and present the marketing returns of your current spending. Then, you can provide a visual representation of how adjusting your spending could increase your ROI. For example, you can use charts on the platform to express how investing in influencers across Facebook, Twitter and Instagram could yield a better ROI than a single TV commercial. By taking a visual and numbers-based approach to justifying your spending, you can clearly explain your reasoning to important financial decision-makers in your company. A digital marketing platform allows marketers to plan campaigns and commit their budgets with a clear set of expectations in mind about the positive financial impact their campaign will have for the company. This way, you can funnel your marketing dollars into the efforts that will make a difference. You can greatly improve your credibility by using a platform for your reporting and analytics. Even though spreadsheets are useful for certain cases and for small-scale marketing tracking and reporting, businesses that want an efficient, comprehensive analytics process need a platform at their disposal. Definitive, reliable, and timely data and insights are all possible with a platform like the Chainlink Marketing Platform. 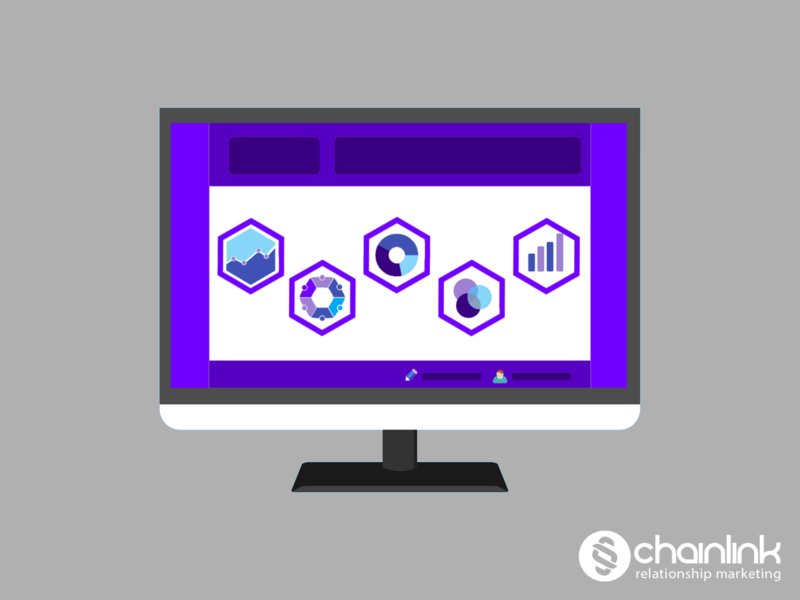 The Chainlink Marketing Platform’s reporting, analytics, and intelligence allow users to see what’s driving revenue, and how the sales can be attributed to your various digital marketing efforts, which promotions are most effective, and how can you improve your overall marketing metrics and performance. The user-friendly interface of the Chainlink Marketing Platform allows marketers to view an easy-to-understand overview of all real-time marketing campaigns, statistics, and interactions in the Command Center. This Command Center has convenient drag and drop capabilities that make it a simple to customize your marketing dashboard with your preferred metrics, charts, and data. Since all of the Chainlink Marketing Platform is updated in real-time, you can see who is interacting with your marketing initiatives. This means you can spot early trends in orders and activity, and track the growth of your customers and recipients over time.